Both mold and mildew can form in your home as a result of moisture problems. Besides the fact that each of these issues start with the letter “M,” the similarities continue beneath the surface, as well. Let’s explore a bit more about each of these household hazards. Mold grows in many different places within the home, from the basement to the attic, and even along outside walls or exposed foundations. 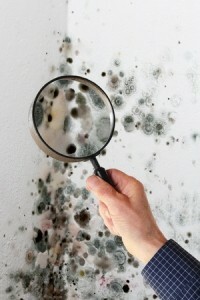 Mold is everywhere, and tends to grow in larger abundance than mildew. Typically mold also is more noticeable than mildew, as it is often colored distinctively in shades of black, green or even yellow or blue. There are also hundreds of different types of mold in existence, and these molds can have different impacts on your health and even different benefits, such as producing medicine or cheeses – though typically not when found growing on surfaces in your home. Mildew is similar to mold, in that both mildew and mold are varieties of fungi that commonly appear in homes. However, mildew tends to only come in two main varieties – downy and powdery mildew. Both of these forms tend to grow in flat patterns, unlike mold which can grow in different sizes and configurations. Mildew also tends to look slimy, whereas molds look fuzz or hairy by comparison. Each mildew variety also comes in more subdued but discernible colors, with powdery mildew generally growing white and downy mildew starting out as yellow in color, with both aging to different shades of yellow, brown and even black. Mold versus Mildew: Understanding the DifferenceIn both cases, remediation and removal requires a comprehensive strategy to remove the growth and prevent the problem from recurring. As we discussed in our previous post about mold myths, mold can easily spread its spores if it is not carefully and completely removed. Plus, if you don’t address the excessive moisture problems, leaks, drips or other issues that are creating conditions conducive to mold growth, the problem can easily return, leaving you fighting an ongoing battle. At Jun’s Mold Remediation, we’ve spent more than a quarter of a century helping homeowners remove and solve their problems with mold and mildew. Our experts can help you identify issues, remove infestations and growths and eliminate the conditions in your home that would allow mold to return. Contact us today for more information or to receive a free estimate.